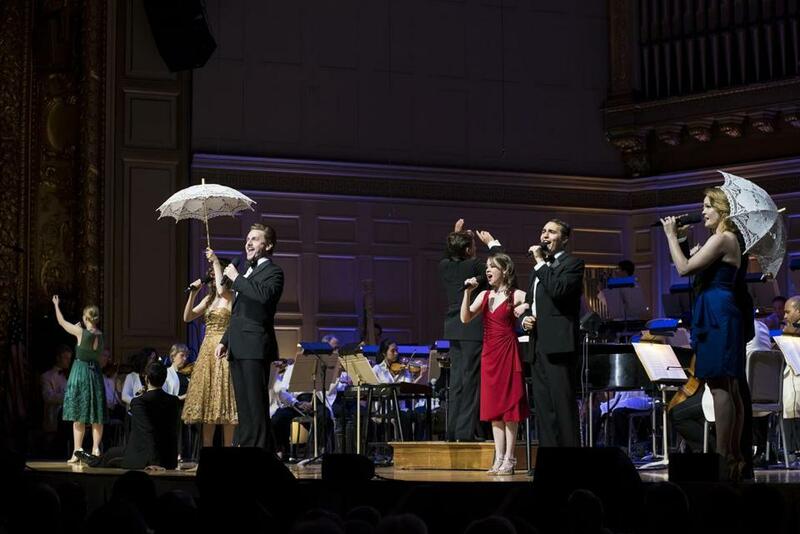 Jason Danieley, center, and Kate Baldwin, right, and vocal fellows from the Tanglewood Music Center performed during the show Wednesday. How long and remarkable has the journey of Stephen Sondheim been? Consider this: Even if his career had ended before John F. Kennedy was elected president, Sondheim would still enjoy a prominent place in musical-theater history. His lyrics for two undisputed classics — “West Side Story’’ (1957) and “Gypsy’’ (1959) — instantly established him as the premier Broadway wordsmith of his generation. Starring the Broadway singers Kate Baldwin and Jason Danieley, with strong contributions from a half-dozen Vocal Fellows of the Tanglewood Music Center — Dimitri Katotakis, Nola Richardson, Davone Tines, Paulina Villarreal, Alison Wahl, and Jason Weisinger — “Simply Sondheim’’ added up to a satisfying and occasionally sublime evening that proved yet again what a roomy showcase this composer provides for all kinds of singers. Did the program have to feature seven selections from “Into the Woods,’’ though? That’s far too many from a show that has been done to death. Baldwin delivered a masterful performance of the title song from “Sunday in the Park with George,’’ in which Dot chafes at her immobility (in every sense) while modeling for her lover, Georges, a painter. Danieley has played Georges onstage before, and it showed in the mixture of delicacy and brassy confidence with which he performed “Finishing the Hat,’’ Sondheim’s musings on the mixed blessings of the creative life. Baldwin brought a tremulous edge of heartache to her rendition of “In Buddy’s Eyes,’’ from “Follies.’’ Both the cast and the orchestra gave everything they had to the finale: “Sunday,’’ from “Sunday in the Park with George,’’ as instruments and voices blended in a stirring version of one of the most beautiful songs ever written by Sondheim, or anybody else. Boston Pops Esplanade Orchestra. Keith Lockhart, conductor. Andy Einhorn, musical director and co-creator. Sarna Lapine, director and co-creator.